A series of vertical and horizontal lines is rendered as perpetual motion through an interactive, generative process. 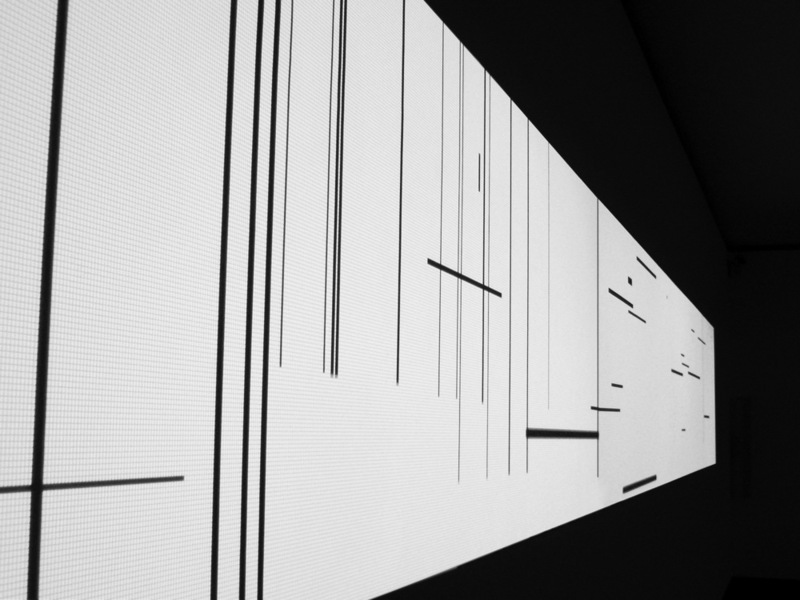 Chosen at random by the installation's software, the lines systematically interact with each other, generating an unpredictable sequence of audio- visual patterns. A process that is periodically repeated once the lines reach a certain speed through their interaction and disappear out of the edges of the projection. Composition consists of a projection whose dimensions are the sum of the width of the 17 paintings (the “Transatlantic Paintings”) Mondrian took with him when he emigrated from Europe to America. The projection on the wall is comparable to the system-space (Panofsky), which Edward Muybridge designed in Palo Alto in the early days of moving pictures: On a precisely segmented trajectory, the galloping horses are recorded as snapshots by photo cameras. Only this segmented space allows us to think of a cinematographic technology that creates moving serial images from motionless frames. Movement as mechanical animation. With Gaviria, the structures of Mondrian’s paintings are set in motion. It is only the geometrical arrangements we see, not the colored surfaces. The geometrical structure of Gaviria’s interpretation is substantially tighter, more complex than the original paintings. Their program of relations, which unfold in every direction, is spatially shortened in this composition. And: They move, the grid is animated, articulated through interactions that repeat themselves continuously as new structures arise. Composition seems to suggest a dialogue with ideas about abstraction as developed in the history Modern art, as well as in their relation to contemporary digital culture. By employing the commonly used tactics in digital culture of retrieving, storing, archiving, mixing and randomizing access to information, Composition underscores the move from Modernism to Informationism, from the importance placed on “purity” of form to the importance placed on information flows.